In which the dada noodle of Wales re-teams with Messengers Manzanera and Eno (2/5ths of Roxy Music) for what is essentially Fear 2. 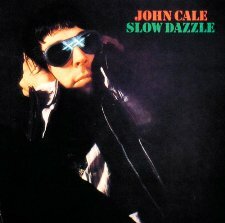 Weathered by coke and booze, Cale’s brogue highlights the humor in tunes that poke loving fun at rock & roll of both the schlock and shock varieties, replete with backing singers and garish echo. The scary Elvis cover is where it all comes together. As the second release from Cale’s residency at Island Records, Slow Dazzle maintains its predecessor’s dark sense of fun but packs less of a punch. (Helen of Troy, the third Island LP, is the weak link. It sounds more gothic and the songwriting sounds less assured.) Combined, these records are the former Velvet’s take on the Brits’ assimilation of all that the Velvet Underground did, with a few fond odes / tips of the hat to Brian Wilson thrown in for good measure. Attitudinally, Cale caps all of it with a grin and a gob of spit.